Megan Crawford is an Associate Scientist who joined the Environmental, Social, and Governance Team in August 2015. Megan provides substantial assistance working with clients on a variety of sustainability projects, including CDP consulting services, GHG inventories, Corporate Social Responsibility reports, and more. Megan has strong interests in environmental sustainability and sustainable development through environmental design (e.g. LEED, solar, green building, xeriscaping, etc.). Megan graduated from the University of California, Irvine in June 2015 with a B.S. in Earth System Science and minors in Biological Sciences and Global Sustainability. While at UCI, Megan was involved with sustainability on campus through PowerSave Campus Program and the Global Sustainability Resource Center. Megan also interned with the Center for Environmental Biology, working in conjunction with Irvine Ranch Conservancy and Crystal Cove Alliance on environmental projects, including vegetation monitoring, ecological restoration, and informal science education. In addition, Megan participated in undergraduate research and completed a senior thesis on Arctic lake productivity in connection with the carbon cycle. On Tuesday, April 24th, ADEC Innovations hosted a webinar to update companies on the changes to CDP’s 2018 Climate Change Questionnaire. 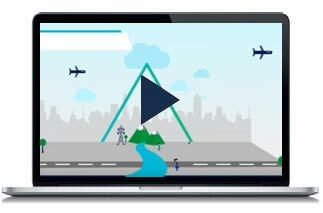 CDP, a non-profit initiative founded in 2000, has worked with corporate and government partners to build the most comprehensive collection of self-reported environmental data in the world. One fifth of global carbon emissions are managed through CDP, with over 5,500 companies responding to their questionnaire annually. Renewable Energy or Sustainable Energy? 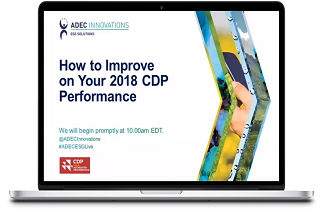 On Tuesday, December 12, 2017, ADEC Innovations hosted a webinar on how to improve your CDP performance. It is important for investors, NGOs, customers, the public and other stakeholders to have access to information on CDP performance. An organization’s CDP Scores can greatly affect the way partners, consumers, clients and the public perceive the organization. To ensure the continuity of a business, it is imperative to have suppliers that are also sustainable. Due to these facts, suppliers and clients alike benefit from maximizing their CDP performance. There are simple ways to improve a corporation’s score, the simplest of which is properly reporting information in questionnaires submitted to CDP. Responses should be as informative, complete and exact as possible. According to the International Energy Agency’s World Energy Outlook - 2016 (WEO - 2016), approximately 1.2 billion people worldwide do not have access to electricity. In addition, at least 2.7 billion people around the world continue to depend on conventional biomass for cooking. Roughly 95 percent of the global population without access to electricity and modern cooking fuels reside in Sub-Saharan Africa and in Asia. About 80 percent of them live in rural communities. Deforestation and climate change are worldwide problems. If not addressed they can have serious ramifications on businesses. Deforestation is a contributor to carbon emissions by destroying the world’s natural carbon sink and thereby contributing to climate change. Up to 2010, there was a net forest loss of 6.2 million hectares per year. As major sources of deforestation and emissions, businesses must seriously address both issues in their operations and supply chains. According to the Paris Agreement and the UN 2030 Agenda for Sustainable Development, a sustainable economy is not achievable without the committed involvement of businesses. However, this in turn is not possible without an enabling environment created by the right policies. Cut Food Costs and Start an Urban Garden! According to the United States Bureau of Labor Statistics, the average household spent $7,023 on food in 2015, a 3.9% change from the previous year. In addition, $4,015 of the total spent on food was considered “food at home,” or groceries purchased, prepared and consumed at home (U.S. Bureau of Labor Statistics 2015). This comprised 57% of the total spent on food per household in 2015. With the average household spending a majority of their food budget on groceries and food to be consumed at home, there is ample opportunity to cut down on total food spending by growing plants in an urban garden. The spread of information and communications technology and global interconnectedness has great potential to accelerate human progress, to bridge the digital divide and to develop knowledge societies. In Part One of our two-article series, we provided an overview of the role of Information and Communications Technology (ICT) in 8 of the 17 Sustainable Development Goals (SDGs). Here, we examine the importance of ICT as it relates to the remaining SDGs. Adopted at the United Nation Sustainable Development Summit in September 2015, the Sustainable Development Goals (SDGs) are a UN initiative of 17 goals and 169 targets to end poverty, fight inequality and injustice, and tackle climate change by 2030. Also known as Transforming Our World: the 2030 Agenda for Sustainable Development, this international agreement among UN members focuses on a broad range of interconnected economic, social and environmental objectives. These objectives address the world’s biggest challenges, and the plan is to achieve them through multi-sectoral global partnerships. A faucet leaking just one drop per second wastes over 1,300 gallons per year! A leak from a hot water source wastes both water and fossil fuels, creating more greenhouse gasses. Most repairs to plumbing fixtures pay for themselves within just a year. Fix it!